Video poker is a game in which skill can greatly increase your chances of winning. It is not like slot machines where it is all about luck and pre-determined results. A video poker player with a bit of cunning can reduce the house edge to less than 1%. Remember the hand-held video poker games of the 90s? These often paid out generously when proper strategy was employed. Obviously, it is not cost effective for casinos to have games that give the punter an edge, so in almost all cases now you will find video poker games with a small edge to the casino. When we say the house edge is less than 1% we want to emphasis video poker is a game of skill; to make the most of this narrow edge you need to follow a strategy strictly. You also need to take into account the online v offline battle. You will generally find better odds on the internet. This is not a sales pitch; it’s just fact that online casino sites can afford to give the player more value. Unless you are playing one of the rare progressive video poker games and are chasing a jackpot, you should only play on games with a house edge below 1%. This article will explain the gameplay in video poker and a bit about how to maximise your chances of winning. The World Gambling List will eventually delve into the most popular variations of video poker in separate articles, where we will talk more specifically about the strategy and house edges for those games. This article will give you a good idea of what video poker is all about, basic strategy and where to play the games online. Video poker is played against a pay table. You are chasing the hands aligned with the video poker title you are playing. Often the best hands resemble poker hands but if you use poker tactics you will come a cropper pretty quickly. The first thing a player does when playing video poker is place a bet on the hand. In almost all versions you receive a major boost on the pay table if you bet the max amount. For instance, betting four coins in a game of Jacks and Better you might receive 1000 credits for getting a royal flush. But when you bet the maximum five coins and get the same hand you receive 4000 credits. It’s a no-brainer to bet max limits once you have your strategy refined. The player is initially dealt five cards and given the option to hold each card. Once the player has chosen which of the five cards they want, the next step is to replace the discarded cards with fresh ones. Obviously you are chasing hands on the pay table, so if it is Jacks or Better you are playing you would need two jacks of any suit, or better, to claim a payout. Keep in mind the best hands can vary dramatically in different versions. A common error in video poker is to stick to poker tactics. In a game of Texas Hold’em you would be thrilled with ace-king off the flop. In video poker it is not necessarily best to have high cards because you are not competing against a player. Claiming a 4-8 straight is exactly the same payout as getting a 10-ace straight. So if you had 7-8 and ace-king in your initial cards in some versions of video poker you are better off keeping the 7-8 if you are chasing a straight because it is open-ended. These are primitive strategy tips for video poker. It is common for players to refer to cheat sheets to ensure they are playing optimal strategy. With a search engine it is possible to find the math behind the different video poker games and how best to work them. The transparency of video poker pay tables is probably the reason the game has endured since its inception in the 1970s. An experienced player can roughly tell if a machine is a ‘full pay’ or ‘short pay’ machine with a two-second glimpse at the pay table. Online casinos and land-based venues with video poker can manipulate the payouts, meaning there might be one casino that pays out 10 coins for a flush while another may pay out only nine coins. These variations can cause significant difference in the overall house edge. There are close to 100 different versions of video poker, with Bonus Deuces and Jacks and Better among the most popular. Different variations carry varying pay tables. In Jacks and Better a common way for casinos to increase profits is to change the payouts for a full house (nine units usually paid out) and flush (six units usually paid out). This is known as a 9/6 game. When the payouts are lowered it is usually referred to as an 8/5 game. The payout of 1 unit less on each increases the overall house edge by more than 2%, a big leap in the grand scheme of things. A more apt question might be what isn’t a good video poker game? We jest, of course. There are upwards of 80 versions of video poker by the World Gambling List’s calculations and there are definitely games that are more beneficial to play. While you will struggle to find a full-pay game of Deuces Wild (return of 100.76%) at an online casino you will find plenty of real money games that return more than 99% of all money going into them. Deuces Wild: This game can range anywhere from 97% return to 99.64% at online casinos. The 2s, or deuces, are wild, meaning they substitute for any other card. For example, if you had two 10s and a 2 you would have three of a kind. 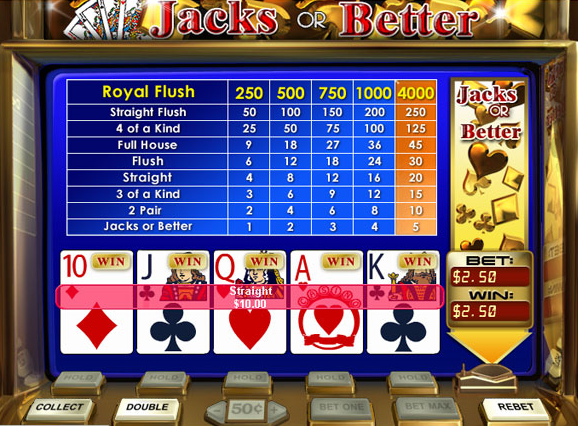 Jacks or Better: This is probably the most well-known video poker game. As the game title suggests, you need a pair of Jacks or better to receive a payout. A full house usually pays 9:1 and a flush should pay 6:1, and if they don’t you probably should run. Aces and Eights: Follows similar rules to Jacks or Better except there are bigger payouts for four-of-a-kinds. The biggest payouts come when you get four aces or eights; sevens are treated separately, but pay less than aces or eights; while paying more than four of any other card. There are hundreds of online casinos with video poker available. Most will allow you to play for free or for real money. There are also plenty of flash-based game sites not associated with casinos where you can play various video poker titles. While video poker is still found in some casinos around the world, it is becoming increasingly rare. It does, however, have an extremely loyal fan base, with punters attracted by its exceptionally friendly house edge. It is simply not cost effective for land-based casinos to stock many video poker games, but online it is easier because it is just software and doesn’t require regular maintenance and is profitable. The things to look for at online casinos are the pay tables, which allow you to assess the house edge. Each casino will have potentially made the game more favorable for them, so it is smart to look for one that suits you. Generally bets can start at a few cents or pence or whatever currency you are playing with per hand. Maximum limits are usually around the 100-unit mark. Choose a casino: Do your research and select a casino from a respected licensing jurisdiction. Follow through on the sign-up process, making sure there is a suitable withdrawal method (USA players beware). Deposit money: This is generally a straightforward process, with plenty of options for most countries. These include credit and debit cards, bank transfers, web wallets and other methods such as bitcoin and prepaid cash cards like Ukash. Choose a video poker game: As we have previously mentioned it pays to do your research before playing video poker. Look for games with generous pay tables and it should help the bottom line. It also pays to practice in play mode if you are new to a certain incarnation of this game. Microgaming: The kings of RNG games. Microgaming have, of course, got an outstanding array of video poker titles. Not all countries can play Microgaming games at fiat casinos because of licensing, but those who can (including the United Kingdom, most of Europe, Australia, New Zealand and many Asian countries) are in for a good time. MG casinos have anywhere from eight to 15 video poker titles with standards such as Jacks and Better, Aces and Faces, Deuces Wild and five or six different versions of multi-hand video poker. Playtech: This is another hugely popular video poker software provider with both instant-play variations and downloadable platforms. Generally casinos will be solely powered by this platform, although there are several exceptions that we actively endorse. This platform, on top of the standard titles, has several impressive progressive video poker games such as Mega Jacks and 10 line Jacks or Better. RGT: This is probably the best-known software provider for USA-friendly casinos. You need to be careful when choosing an RGT casino to play video poker at because there are several well-known operators with poor reputations. This largely stems from issues surrounding cash-outs. RGT has around 10 video poker games, with the titles drawn from well-known variations and a unique title called All American Poker. Net Entertainment: NetEnt is the new kid on the block, at least when compared with the aforementioned companies. But the product from this Swedish company (NetEnt is licensed in Malta) is outstanding, with their slots some of the most popular and inventive in the world. The video poker offering is pretty standard, with six different titles, including Jacks and Better and Aces & Faces.